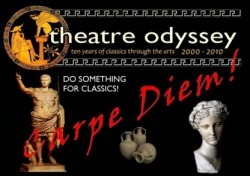 Hitchin Girls' School Classics Society are DOING SOMETHING FOR CLASSICS! They're producing Aristophanes' 'Frogs', and Theatre Odyssey wish them the very best of luck! Watch this space for pictures, programme etc! Meanwhile, GO AND SEE THE SHOW! In March the Senior Classics Society (including sixth formers from Hitchin Boys School as well as HGS) staged an adapted production of Aristophanes’ play ‘Frogs’. This was performed in the style of Ancient Greek comedy, albeit with modern references and costumes. The play was organised and performed almost entirely by Classics students from Years 12 and 13, with thanks to Miss Hay for a lot of hard work and encouragement, and Mr Murdoch from HBS for his acting talents! The event was a huge success and all the cast are to be congratulated for an outstanding performance. Many of the parents, students and members of the public who attended remarked on how impressed they were with the quality of acting and level of professionalism. A great evening was had by all, and an impressive profit of approximately £200 was made. This will go to the Classics Department with a view to staging a similar, bigger, better production next year. Thanks also go to the Year 7s of the Junior Classics Society and students from Year 12 who contributed refreshments that were sold during the interval. The profit from this (£18.50) is to go to Great Ormond Street Hospital.